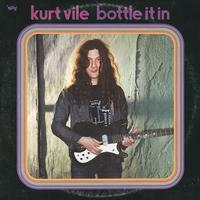 Travel can inspire in surprising ways: Kurt Vile discovered as much making his first record in three years, the eclectic and electrifying Bottle It In, which he recorded at various studios around the country over two very busy years, during sessions that usually punctuated the ends of long tours or family road trips. Every song, whether it's a concise and catchy pop composition or a sprawling guitar epic, becomes a journey unto itself, taking unexpected detours, circuitous melodic avenues, or open-highway solos. If Vile has become something of a rock guitar god-a mantle he would dismiss out of humility but also out of a desire to keep getting better, to continue absorbing new music, new sounds, new ideas-it's due to his precise, witty playing style, which turns every riff and rhythm into points on a map and takes the scenic route from one to the next. Using past albums as points of departure, Bottle It In heads off in new directions, pushing at the edges of the map into unexplored territory: Here be monster jams. These songs show an artist who is still evolving and growing: a songwriter who, like his hero John Prine, can make you laugh and break your heart, often in the same line, as well as a vocalist who essentially rewrites those songs whenever he sings them in his wise, laconic jive-talkin' drawl. He revels in the minutiae of the music-not simply incorporating new instruments but emphasizing how they interact with his guitar and voice, how the glockenspiel evokes cirrocumulus clouds on "Hysteria," how Kim Gordon's "acoustic guitar distortion" (her term) engulfs everything at the end of "Mutinies," how the banjo curls around his guitar lines and backing vocals from Lucius to lend a high-lonesome aura to "Come Again." These journeys took Vile more than two years to navigate, during which time he toured behind his breakout 2015 album b'lieve I'm goin' down, recorded a duets album with Australian singer-songwriter-guitarist Courtney Barnett, opened for Neil Young in front of 90,000 people in Quebec, famously became a clue on Jeopardy, hung out with friends, took vacations with his wife and daughters. "I've been bouncing around a lot and recording all over. My family would meet me in the middle of America, and we'd go on a road trip somewhere. I would record in-between all that stuff." As Vile prepares for another round of lengthy tours and countless shows, these songs should prove good company, reminders of the love and responsibility he has toward those he leaves at home and those he meets along the way. That makes the sentiments resonate more strongly and lends Bottle It In an emotional weight. "It's like that moment on the airplane," Vile says, "when you're on your way somewhere and you have that burst of panic. When you're terrified of dying, that's when you want people to know you love them."